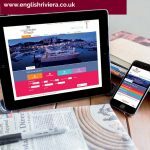 The ERBID 5-year Business Plan pledged to invest in a new fully mobile responsive Destination Website and a new official English Riviera website site was launched November 2017. The site is managed by the ERBID’s Digital Marketing Manager Nathan Hoare, whose priority is to enhance the site’s content (copy, images, videos) so that the site not only performs well on the search engines but Informs, Inspires and Influences visitors to the site to choose to visit the English Riviera. A new Be Inspired section has been built into the site including a new English Riviera Blog which is intrinsically linked to our increasing Social Media Marketing activity, including the most recent Award Wining Beaches, Amazing People Campaign. All 1000+ paying ERBID partners are entitled to a FREE full-page advert on the website with the opportunity to include up to 600 words of copy and multiple images to promote their business. We encourage you to visit the web site and your business page/s and check your content – are you making the best of your advert? All images used on the website are also available for partners to use in their own marketing activity simply visit the ERBID Image library and create and account for free use.